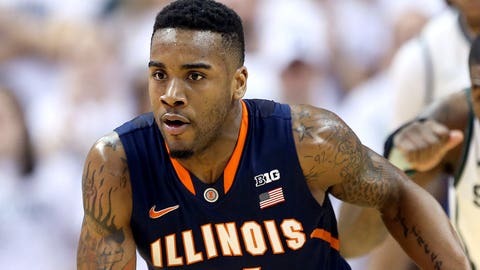 Fighting Illini G Rayvonte Rice brings the ball up court en route to Illinois' 53-46 win over Michigan State on Saturday in East Lansing, Mich.
EAST LANSING, Mich. — Illinois is on a roll thanks in large part to its stifling defense. Fighting Illini coach John Groce, though, is not ready to celebrate. Tracy Abrams scored 12 points, leading Illinois to a 53-46 win over No. 18 Michigan State on Saturday. The Fighting Illini (17-12, 6-10 Big Ten) have held four consecutive opponents to fewer than 50 points for the first time since the 1947-48 season, according to STATS LLC. "That’s hard to do in this league with the great coaches and great teams," Groce said. Illinois has three straight victories for the first time since winning four in a row from Dec. 21 to Jan. 4. That successful stretch included a win over then-No. 23 Missouri. "As soon as you act like you’ve arrived, you’re going to fall pretty quickly," Groce said. The Spartans (22-7, 11-5) are falling fast. They’ve lost two straight and six of their last 10 games. Michigan State was at full strength for the first time in nearly two months, but simply wasn’t good enough to beat a streaking team that seemed more inspired. "I thought our energy level was at an all-time worst," coach Tom Izzo said in a voice barely louder than a whisper. Branden Dawson returned from a broken hand and played for the first time since Jan. 21, when he helped the Spartans beat Indiana to improve to 18-1 overall and 7-0 in conference. Michigan State’s Gary Harris had 19 points, and didn’t get much help from his teammates. The Spartans scored a season-low 46 points — five fewer than they had two weeks ago in a nine-point loss to Nebraska. They made 39 percent of their shots and had only one player with more than seven points. Illinois might’ve had a lot to do with that. "They defended very well, which they’ve been doing," Izzo said. "They turned us over a lot and turned those turnovers into touchdowns." Adreian Payne, who averages 16-plus points, had just four points to match a season low. Payne wasn’t healthy enough to play when the Spartans beat Illinois by 16 points Jan. 18 on the road. Illinois, meanwhile, had a trio of double-digit scorers and made nearly 48 percent of its shots. Malcom Hill and Rayvonte Rice each had 10 points. The Illini led by as much as 12 points in the first half before falling into a 28-all tie at halftime. "We just wanted to go out there and set the tone early," Abrams said. "We wanted to start the game fighting, and that definitely had a big influence." After giving up the first basket in the second half, the Illini didn’t trail again. Midway through the second half, Illinois took advantage of a call that went its way that enraged Izzo — and appeared to rattle his players. Harris had a steal and a layup waved off because the officials decided a shot-clock violation happened before the turnover. Izzo screamed at the officials about the call and pounded his fist on the scorer’s table as he shouted some more. "Our own people screwed up our own clock," he said. Instead of the basket pulling the Spartans within a point, its deficit stayed at three and quickly grew to six points. "We were responsive all night," Groce said. The Illini won at Michigan State for the first time since March 3, 2006, and beat a ranked Big Ten team for the first time since Feb. 10, 2013, when they knocked off No. 18 Minnesota. Like Groce, Abrams isn’t ready to pump up his team’s tires. "We’re not getting ahead of ourselves," Abrams said. "We’ve just got a fighting mentality right now, and we’ve got to keep it that way."